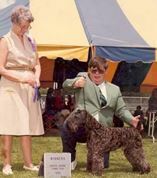 Columnist Brian Lowney showed his first Kerry Blue Terrier, Connolly of Castletown — named in honor of the small fishing port in West Cork, Ireland, from whence his family hails — at a dog show in 1981. Photo courtesy of Brian Lowney. I attended my first dog show 25 years ago, hoping to find a basset hound breeder with a litter of bouncing, floppy-eared pups for sale. Not knowing the first thing about these fun-filled events, I arrived mid-afternoon, just as the group judging was starting. As I watched the hound group enter the ring, my heart was stolen by a beautiful tri-colored “hush puppy,” whom I later learned was an English import with a successful show career. After spending a few minutes with the charming basset’s proud owner, who proclaimed the joys of owning a pack of these eager scent hounds, I was even more determined to own a basset. My steadfast Irish mother, however, always had wanted a Kerry Blue Tterrier. Anyone who has ever lived with one of these charming yet unyielding women knows who won the argument. A few weeks later, an adorable armful of black fur arrived, complete with two pasted ears, a docked tail and a heart as big as the Emerald Isle. Our lives were changed forever. We named the gregarious pup Connolly of Castletown, in honor of the small fishing port in West Cork where my father’s family was born. While Connolly was not much of a show dog, he did manage to earn eight points, and retired to a life as a beloved family pet and faithful companion. Perhaps my fondest memory of this great dog is how he patiently guided my late father Thomas — once a robust steamfitter, but later afflicted with Parkinson’s disease — on their morning walks. When it became too much for my dad to continue, the big gray-blue dog just sat by his chair, never leaving my father’s side except to trot off for an occasional refreshment. Connolly is also responsible for getting me involved in the sport of purebred dogs, which ultimately led to my career as a writer, since my first published piece appeared in a dog magazine many years ago. My second dog, Cavan’s Minstrel Boy, was a handsome devil who became my first AKC champion. Nicknamed Toby, this dog was one of the most obedient canines I have ever met and was a joy to own and exhibit. He loved the show ring and would proudly stack himself whenever a judge was approaching. Sadly, this handsome dog died at an early age of cancer, much like his breeder, Maureen Lorentz of Missouri. She generously sold many excellent show dogs to novice handlers throughout the United States, hoping that they, too, would achieve as much happiness and success with Kerry Blues as she had enjoyed with her dogs. Ruth Gettings, a knowledgeable and devoted Kerry breeder from Staten Island, N.Y., sold me my third dog, a lovely little girl who became Champion Belturbet Jacaranda. Jaqui, as she was affectionately called, gave the boys a run for their money. She was a beautiful specimen of the breed, and instantly showered kisses upon anyone who met her. At home, she was the boss and the boys always let her have her way. Despite what people might think about terriers, all three of my Kerries got along fabulously, and loved our cats, as well. As Connolly grew older, his younger pals guarded him for dear life and hung their heads in sorrow for days when they realized that he would not be coming home from what proved to be his last trip to the veterinarian. When Jaqui had a litter of pups, Toby became the surrogate father and supervisor of the nursery, once the protective mother let him near the litter. Toby proved to be a resourceful baby sitter, and took great delight in playing with the puppies and teaching them the ways of the world. He’d chase them around the yard and toss toys at them for hours, relishing every minute of his new role. The Kerry Blue Terrier was developed in Ireland by farmers who wanted to rid fields of small rodents. Irish and English hunters, on the trail of small game and birds, prized the hardworking Kerry, which could retrieve on land and in water. According to the breed standard, a typical Kerry blue should be upstanding, well knit and in good balance, showing a well-developed and muscular body and true terrier character. Kerry Blues are often regarded as mean-spirited and of less than desirable temperaments. While this is true of some specimens, including some imports from Ireland and England, most Kerry Blues, when properly trained and socialized, are gentle and loving dogs. The breed’s most distinguishing characteristics are its soft, dense, wavy coat and rich color. Kerries are born black and go through a process called “clearing” in which their coat matures to a color that ranges from deep slate to a light gray blue. Black on the muzzle, head, ears, tail and feet are permissible in dogs of any age. When a dog is clearing — a phase that is allowed in the show ring up to the age of 18 months — a young dog’s coat may be tinged with brown. Solid black adult dogs are disqualified from the conformation ring. Kerry Blues enjoy relatively good health, although like many breeds, they are prone to cancer and often develop sebaceous cysts that must be removed by a veterinarian. The plush Kerry coat must be trimmed, and requires a daily brushing to remove debris. Since Kerries don’t shed, many people with allergies can tolerate these dogs. Kerries are medium-sized dogs, measuring 18 1/2 inches at the withers in males, with females measuring slightly less. Adult Kerries should weigh between 33 and 40 pounds. While Toby and Jaqui could be trusted off leash, Connolly rivaled Houdini as an escape artist. The only way to capture the errant terrier was by driving down the street, opening the car’s back door and inviting the wayward dog for a ride. Since Connolly enjoyed traveling, he’d always fall for the ploy and jump right into the back seat. I recommend that Kerries live in a home with a fenced-in yard or with an owner committed to offering the dog several daily opportunities for exercise and plenty of long walks. The Kerry Blue Terrier is an ideal companion for anyone looking for a comical and lively dog. Ask anyone who has shared life with one of these Irish leprechauns, and they’re bound to tell you that once your heart has been stolen by a Kerry Blue, it will never be the same again.